When the Washington Redskins decided that Nate Sudfeld wasn't among the 53 players in their camp worthy of a roster spot in September of 2017, they either underestimated the skills that he possessed, or they failed to coax those skills out of him. Take your pick. The Redskins cut Sudfeld, and were interested in signing him back to their practice squad, to which Sudfeld essentially said thanks, but no thanks, I'm going to Philly. 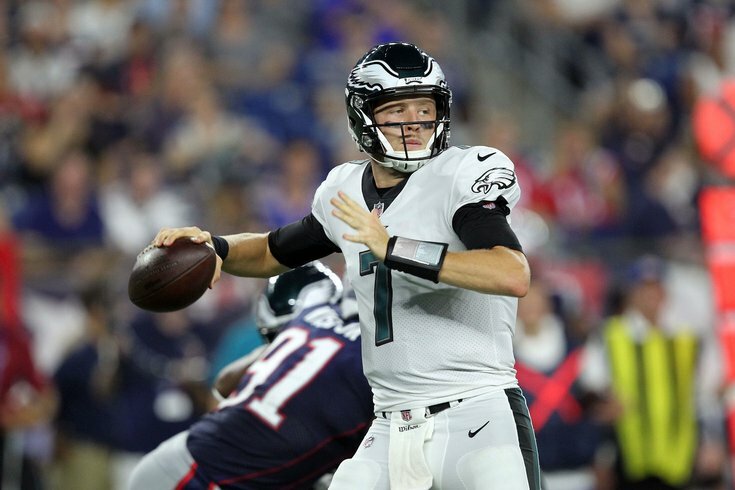 After one year as an apprentice with the Eagles, Sudfeld already looks like a capable successor to Nick Foles as the backup to franchise quarterback Carson Wentz. Throughout 2018 Eagles training camp, Sudfeld displayed a pretty deep ball, decent velocity, good accuracy in the intermediate areas of the field, and better mobility than you would expect of a 6'6, 227-pound quarterback. However, he lacked consistency at times. Those glimpses of Sudfeld's skill set have carried over in to the preseason games. On Thursday, Sudfeld had his best showing as a pro in the Eagles' second preseason game against the Patriots. "I was very proud of Nate," said Foles of Sudfeld's performance. "I thought he went in and it’s not always easy to get a rhythm and I think that he was really doing a good job of letting them rip downfield, giving his receiver a chance. When plays were breaking down he was doing what he could with his legs but being as smart as he could, throwing balls away at times. I thought he played really well. I think just from the point he got here last year when he came from Washington, I think he’s improved like crazy and he continues to. So it’s fun to – he’s like a little brother to me – so it’s fun to see him go out there and sling it around a little bit and give us an opportunity to come back." The following is a cutup of all of Sudfeld's throws in the first two preseason games, with notes thereafter. • 0:07: This is obviously a bad throw/decision, and Sudfeld’s worst rep of the preseason. • 0:16: Easy throw, but the misdirection is sold well. • 0:34: This throw is simply not there. Throw it away and live to see another down. • 0:50: Nice seam throw on the money to Goedert. Sudfeld doesn’t have the same velocity as, say, Carson Wentz, but it’s more than enough to be an effective quarterback in the pros. • 1:22: This is really nice. Sudfeld eludes the blitzing LB, calmly escapes from the pocket to extend the play, waits for Goedert to settle into an open area in the zone, and fires a strike to him while on the run. • 1:47: Doug Pederson categorized this interception as a slip by the receiver, Bryce Treggs. • 2:05: Beautiful deep ball to Shelton Gibson. Money throw. • 2:50: Another deep ball that’s where it should be, but the cornerback simply made a nice play on the ball. • 2:28: Yet another good deep ball that looks like it’s where it should be (while getting hit, no less), and the play results in a defensive pass interference call. • 3:31: I don’t like this throw. When the receiver is just standing there near the sideline near the line of scrimmage, you have to have to velocity on the throw, giving the receiver a chance to get it and make a move. Sudfeld kind of lollipops this throw to Carter, who has no chance to do anything with it after the catch. • 3:39: Nice, accurate throw 20 yards downfield to Goedert. • 3:59: With some bodies around him, Sudfeld doesn’t have a chance to step into this, but he still delivers an accurate throw that hits Carter in stride about 20 yards downfield. • 5:05: Obviously, Matt Jones can’t catch. • 5:12: Nice throw on the run to his left. • 5:20: This is a throw that requires some velocity, as opposed to a deep throw with touch. The ball placement isn’t perfect, but it’s close enough for Treggs to get both hands on it. • 5:27: While the throw is slightly behind the receiver, Sudfeld does a nice job stepping up in the pocket, keeping his eyes down the field, locating the receiver, and throwing on the run. • 6:05: Great placement on the throw to the back corner of the end zone to Goedert, but the defender makes an equally great play. • 6:18: Great throw, with anticipation, while falling away from the rusher. Outstanding. • 6:26: Near-perfect deep ball to Gibson for a gain of 57. Sudfeld’s deep ball is probably his best attribute. • 7:08: Another accurate throw to the intermediate area, 20 yards down the field to Goedert. • 7:17: Not to sound hyperbolic, but this is yet another outstanding touch pass on a deep throw. Perfect placement for the touchdown. "One of the biggest differences is getting reps," said Sudfeld of his time with the Redskins verses his time with the Eagles. "I didn't get very many reps at the last place. And it makes sense. I'm not bitter about it or anything. They had two great quarterbacks at the last place, but I think that getting reps and being able to make a mistake and come back from it, knowing that you're going to get opportunities really kind of eases your mind, knowing that you can go out and trust what you see, and try to make throws. "So I think getting reps, and I think physically I've developed a lot more in the last year. I feel like I'm getting the ball out faster, and my feet are a little bit quicker." In Philadelphia, Sudfeld has two even better quarterbacks playing ahead of him than he had in Washington, and yet, the Eagles have found a way to get him reps, allowing him to improve as a player. Temporarily, Sudfeld's confidence was shaken by his release last year, but he regrouped and put it behind him. "For a split second I was like, 'Man, what's going on? Am I not the player I think I am? But I think it was really just good for me to swallow my pride, and get back to just working hard. I came here early mornings, late nights, just trying to make sure I was turning every stone, making sure I was doing everything I could to be the best player I could be. And I knew, after a couple initial thoughts, I know I can do this. I know I can do this at a high level. "Being around this environment, these coaches and players, really helped me too, and I feel like I was able to flourish. I feel like this last year has been big in my development." At a minimum, Sudfeld is a clear roster-worthy NFL player. Best case, if he continues to progress at the rate that he has over the last year, Sudfeld has starter potential. The Eagles were smart to recognize Sudfeld's upside from afar, while the Redskins couldn't see it up close.